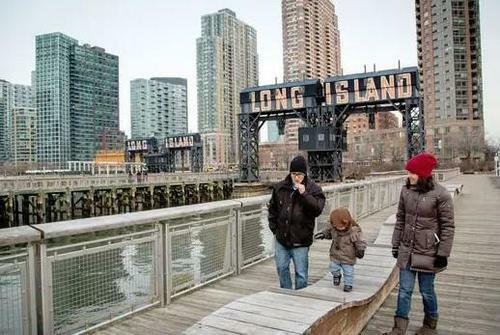 Long Island City was bracing for a serious development boom even before Amazon - allegedly - moves in. Earlier this year, much of the Long Island City neighborhood was already designated as an "opportunity zone", or an area that will offer significant tax benefits for those "develop" there. As the NYT reported last night, Amazon is said to have selected Long Island City alongside Northern Virginia’s Crystal City, for its second US headquarters and will be getting generous tax breaks if it does so. The move is expected to bring thousands of brand new employees to Long Island City, which will help entice builders from all over. It will also led to unprecedented congestion and soaring real estate and renta prices. While Amazon has yet to confirm the NYT report, Governor Andrew Cuomo continues to beg for Bezos to pick the venue, even joking that he would change his name to "Amazon Cuomo" in order to win over the company. Cuomo is widely expected to grant numerous additional concessions to the company for opening there, in addition to already having granted the "opportunity zone" designation. As a result, even before Amazon's decision, real estate developers and investors have been trying to raise money to take advantage of the tax breaks that will come in Long Island City. Many of them do this by taking capital gains and putting it into funds that target development and opportunity zones, which will defer taxes until 2026. This will also potentially reduce liabilities by as much is 15%, according to Bloomberg . Those who invest in the area and hold their investments for 10 years, can defer paying the entire capital gains on their appreciation (assuming there is one). Real estate developers seek out these types of high growth areas where they can get the most bang for their tax-adjusted buck. Rules are still being finalized by the federal government about what types of development are allowed to occur in these areas, but both towering residential towers and light commercial offices and retail space are expected to qualify. The incentives were a little-known provision of the Republican tax overhaul that President Donald Trump signed into law late last year. Since then, they’ve captured the attention of developers and government officials because they have the potential to make projects in long-neglected areas more enticing. Treasury Secretary Steven Mnuchin has estimated that $100 billion may eventually flow to the roughly 8,700 struggling communities scattered around the country that were selected by state governors and officials in U.S. territories. This rounds out billions of dollars of investments that Long Island City has seen over the last couple of years, mostly due to its proximity to Manhattan. Just last week, Mayor Bill de Blasio announced that he would dump another $180 million into the neighborhood's infrastructure, including upgrades to its sewer system and a new school. Long Island City is already betting big that it'll be Amazon's new home, optimistically building 4,500 new residential units with another 1,700 proposed. Until recently, developers and brokers had been growing concerned about the growing supply of residential units - a concern which, however, Amazon should be able to answer. "Our concern in Long Island City has always been that a lot of new supply is coming online. There’s always been a question of: Is there enough demand? This solves that in a pretty direct way. It brings in demand. People who need housing, who need hotels, who need retail." And all these "perks" will cost local residents is billions in foregone taxes. The hope, naturally, is that the upside from the move offsets the lost revenue. Some are already scrambling to frontrun the move: Developers will want to act fast as the combination of tax breaks and a major new corporate campus could quickly drive up the cost of land and commercial real estate in the area, said Rob Wrzosek, a managing director at Berkadia, a mortgage lender backed by Warren Buffett’s Berkshire Hathaway and Jefferies. It’s still unclear as to where exactly Amazon will position itself in Long Island City, assuming of course that it does end up moving there. One thing is for certain, if it moves into the area - while it will help catalyze interest in Long Island City and kick the post-industrial area's development pace into overdrive - the company will pay even less taxes for the foreseeable future. Meanwhile, political opposition to Amazon’s potential move is already mounting, with calls to extract concessions from the tech giant and even levy a "gentrification" tax. Jimmy Van Bramer, a city council member who represents the area, said that not all his constituents are excited about the prospect. “We need to know what Governor Cuomo and Mayor de Blasio have promised Amazon, and what Amazon has offered the city in return,” he said. Someone should probably tell Jimmy that at the end of the day, whatever the world's richest man wants, he gets.